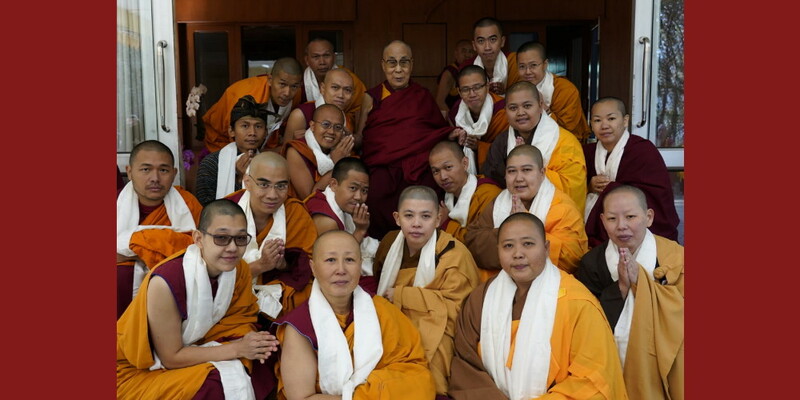 Ever since the last heart issue suffered by His Eminence Dagpo Rinpoche back in November 2015 in India, which resulted in the rescheduling of the annual Lamrim Retreat in South East Asia region, the great Tibetan Lama has not yet been able to visit the disciples in Indonesia. However, during the month of October in 2018, Dagpo Rinpoche managed to visit the disciples in Dagpo Dratsang in Kullu, Himachal Pradesh, India. It was at this period that the Indonesian disciples took the opportunity to visit the monastery, a-must-to-do-pilgrimage that has been done annually by Kadam Choeling Indonesia (KCI) as a dharma center and community since the resettled monastery was inaugurated in 2005. The original schedule of the Dagpo Monastery include a visit and teaching session by His Holiness the 14th Dalai Lama. Unfortunately, it was cancelled due to the heavy flood striking the mountainous area of Kullu-Manali. The Indonesian disciples were all ready to expect with the original schedule with flight tickets already issued and confirmed before the cancellation news broke out. And in this crucial moment of decision, Venerable Bhadra Ruci instructed the Indonesian disciples to adjust the travel itinerary by visiting Dharmsala, the seat of the Lotus Throne Holder. If the Master cannot come, then the disciples can in turn make a request to pay a visit. Hence, there were 128 names from Kadam Choeling Indonesia enlisted in the official list of audience with His Holiness, the very first of such an occasion for the Indonesians. The session fell on October 11th, 2018, at Kundun’s private residence. 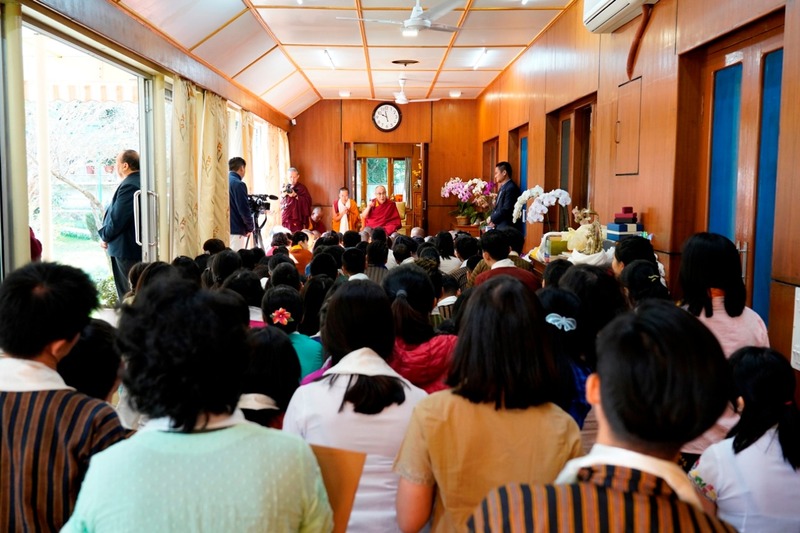 On what was first thought to be a short session of exchanging greetings turned out to be a full two-hour session with His Holiness giving advice to all the participants. His Holiness praised Indonesia as a diversed tolerance country with muslims as the majority. He also emphasized on the importance of faith based on reasoning and that Buddhists nowadays must become a 21st century buddhist. Make benefit to all beings. The Indonesians are celebrating the 30th Anniversary of Dagpo Rinpoche’s activities in Indonesia, in programs and offerings coordinated under the title “Three Decades of Cipta, Karsa, and Karya Nusantara”. The title was first officially launched on August 16th, 2018, taken from the same date when Dagpo Rinpoche first landed on Bali, the Indonesian Archipelago dubbed “Island of the Gods” (Pulau Dewata), back in 1989. During the recent visit by Kyabje Ling Rinpoche to Kadam Choeling Holland in the Netherlands, an important message was conferred. Ling Rinpoche told a story about his predecessor, the old Ling Rinpoche, who remembers the perfect Guru Devotion practice Dagpo Rinpoche has for his Teacher. A Guru Devotion in thought and deed, by putting into practice the Instruction from his Guru. Many students got tears in their eyes, even the translator stop explaining and was in tears. Also stresses about the age of Dagpo Rinpoche—since Rinpoche’s long life depends on the practice of the students. He mentions about a pure practice and the importance of a kind heart. 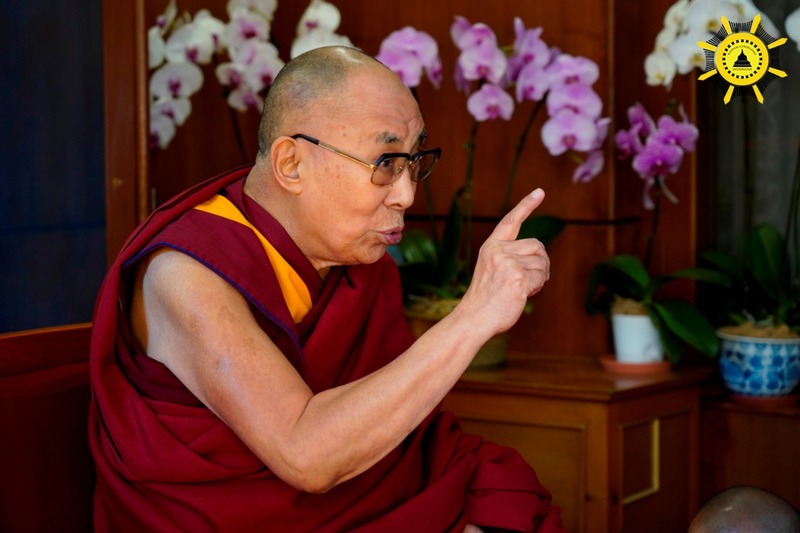 The Tibetan spiritual leader, the Dalai Lama, was admitted to hospital in the India capital of New Delhi with a chest infection, but is doing fine, an aide said on Wednesday, as social media users prayed form the Buddhist monk’s fast recovery. “His Holiness is doing fine now,” Tseten Ssamdup Chhoekyapa, the Dalai Lama’s press secretary, told Reuters, without giving details. A hospital official declined to comment on his medical condition, citing patient confidentiality. Many of his supporters posted messages on social media wishing him a speedy recovery. “Concerned that he has been hospitalized,” tweeted Naveen Patnaik, chief minister of India’s eastern state of Odisha. 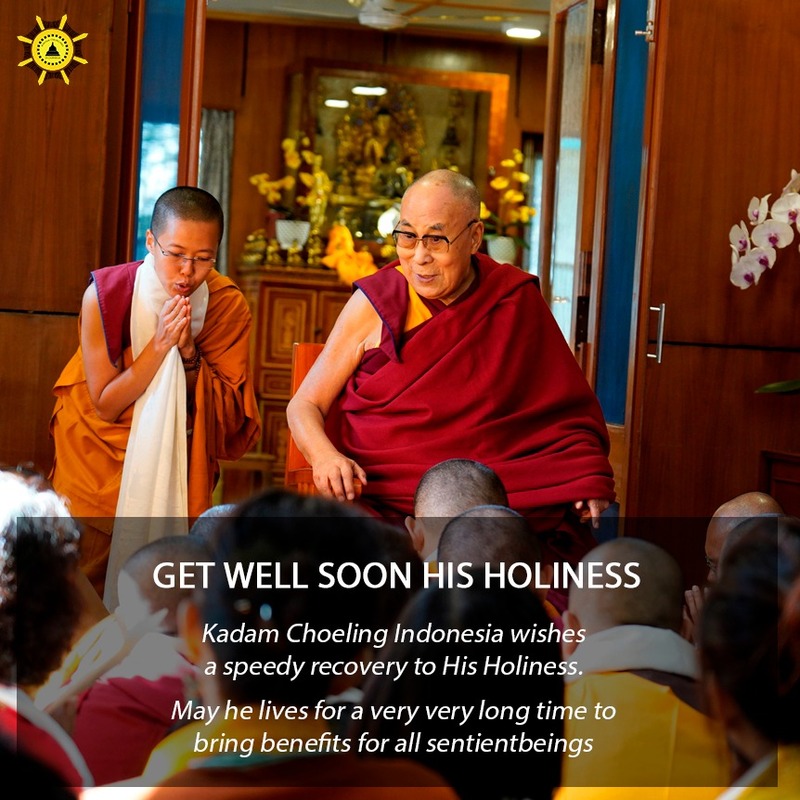 Kadam Choeling Indonesia wishes a speedy recovery to His Holiness. May he lives for a very very long time to bring benefits for all sentient beings. 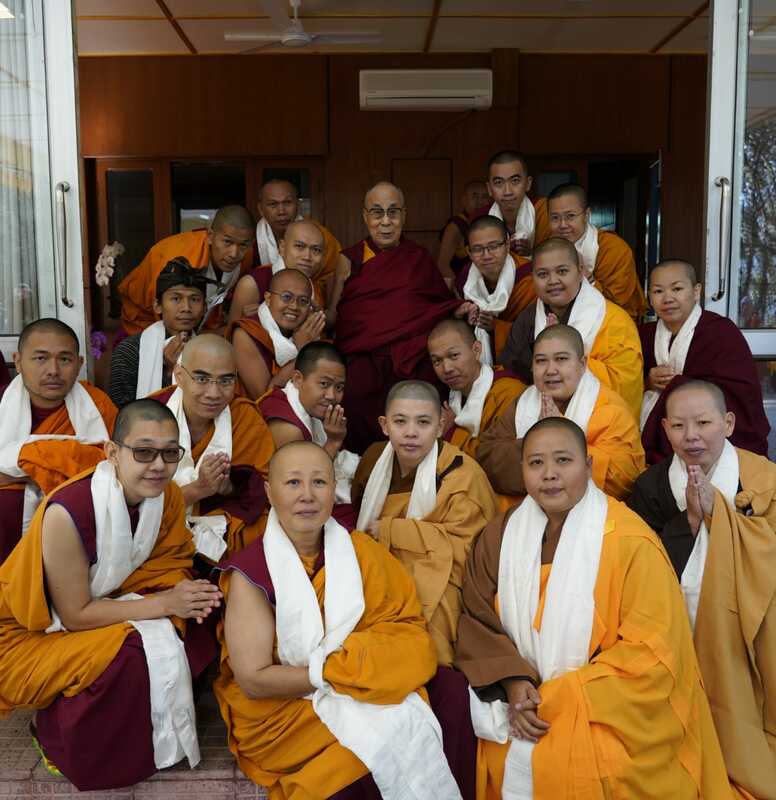 Many Indonesians have received dharma teachings and initiations from His Holiness, thus benefited from those opportunities.